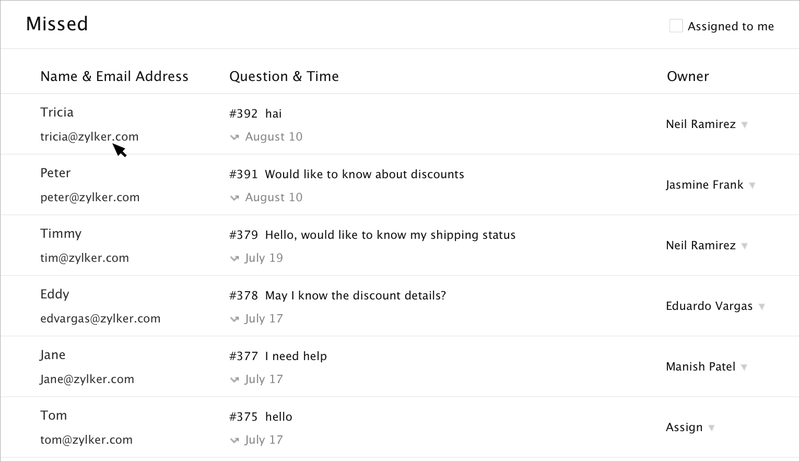 Another sub-section of the Visitors Online Module, you can access this view only when a visitor attempts to initiate a chat with your customer support operation through live chat, and neither you nor your operators answer. In the Missed Visitors view, you have access to the requests that are automatically created each time your Zoho SalesIQ misses a visitor’s chat request. This view is accessible from the left-hand navigation under the Visitors module, any time your Zoho SalesIQ has a Missed Visitor that has yet to be addressed. As with the other views, you can also see the total number of Missed visitors by the number to the right of the view’s link in the Visitors Module. Click Missed to enter the missed visitors view. Here you can see each missed visitors name and e-mail, along with the question they asked and the time they submitted the request. You can also see what agent has been assigned to take care of the request, or you can assign one yourself by clicking assign and choosing an agent from the drop-down menu. Use the included search to find the agent you intend to assign the request to, and then click the agent to finalize the assignment. As with all the Visitor views, you can click the visitor’s name to view the complete question they submitted, and use the icons at the top-right to view the visitor’s detailed information and notes section. To reply to the missed request, click the Reply button at the top right, and type your reply in the editor that will appear. Click Send to send the message, or Send & Close to deliver the reply and close the outstanding ticket associated with the missed chat request. 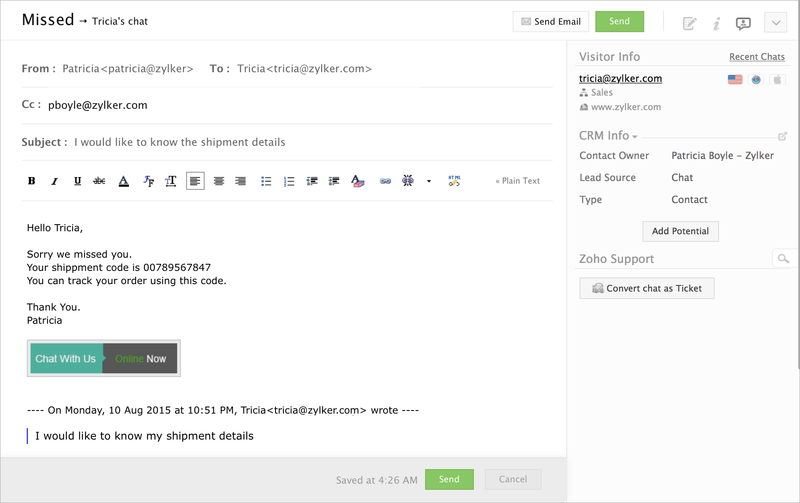 It is also easy to add someone to the message, just click +Cc on the right side of the window even with the visitor's e-mail address line and you can copy anyone on the message--this is an easy way to keep your supervisor or another team member who helped this customer in the loop. You can also close the outstanding request by clicking the Close button at the top right. In the same way you reply to missed requests above, you can also use Zoho SalesIQ to send reply mails directly to any visitor, even if their request has already been closed or they chatted with another agent. Wrap up any outstanding questions or follow-up directly with customers quickly and easily. 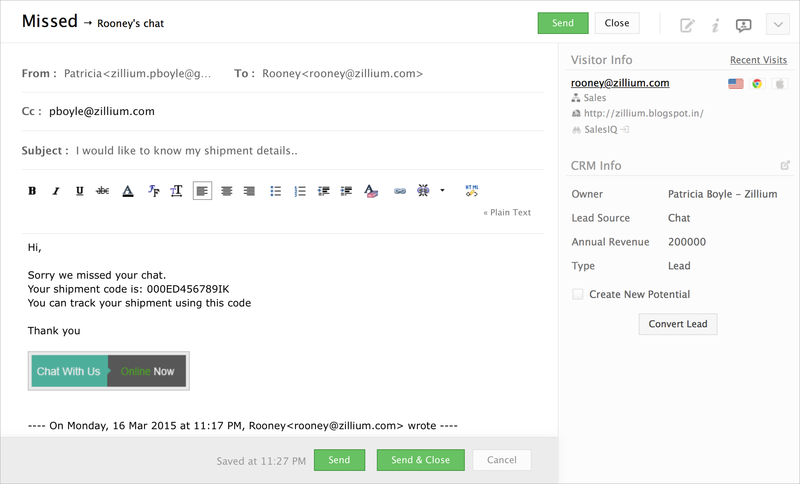 With access the the chat transcript directly below the mail editor, you have the information you need to accurately respond to a customer all from one window. Your mails get saved as you draft so now you can attend any live chat while drafting a mail. Just a click on the reply button again will get back the mail from where you have left.